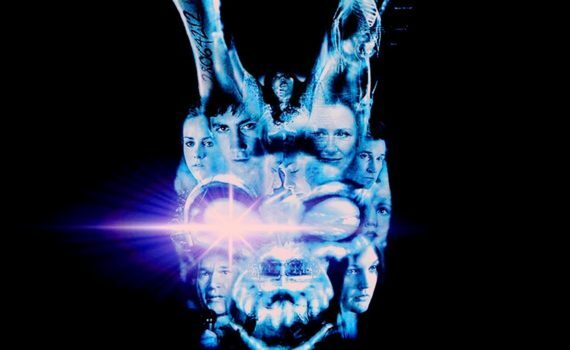 Donnie Darko may not seem as deep, dark, and delightful to me at the age of 34 as it did at the age of 18, but this cult classic holds up, if a bit tenuously and despite flaws that seem more obvious now. Writer/Director Richard Kelly would go on to do …absolutely nothing else …and this lack of success doesn’t seem surprising now, looking back, because nothing in this film shouts ‘masterpiece’. What stands out are the delicate moments and performances that are still there to catch your attention if you’re looking for them, but the movie itself fails to wow if you take it as a whole. I wouldn’t have said that 16-and-a-half years ago, but I’m a different audience member now, and the way I look at cinema has definitely shifted from heart to head, at least for the most part, a fact that doesn’t exactly bode well for Donnie Darko. A young man from California named Donnie has the unusual habit of waking up in strange places around his hometown; golf fairways, rural streets, you name it. His trouble sleeping is linked to his mental and emotional disorders, issues that he talks to a therapist about and takes medication to control. His family is normal, happy, Donnie is extremely bright, he just can’t accept the supposed truths about the world, can’t find his place in the circle, and therefor can’t function without outbursts and extreme thoughts. He gets lucky one night, as an evening’s sleepwalk takes him out of his house, away from a bedroom into which a jet engine will randomly fall one October morning. This brush with death sets off a new series of hallucinations and manic musings, introduced by a man named Frank who is dressed in a freaky rabbit costume and comes to Donnie in his dreams. Is he going insane, or is there some truth behind his delusions? The final scene and its underscoring by Mad World is perhaps the reason this film gets so much credit; it ends on an extremely high note for, story-wise, ending on such an extremely low note. This moment, like many others, has become iconic, and rightly so; Donnie Darko is a movie of special moments that film fanatics will never forget. Donnie’s argument with his sister at the beginning, “chut up!”, Sparkle Motion, references to Graham Green and Richard Adams; I understand why I thought I loved this story when I was a teenager. And the cast is killer; Patrick Swayze, Drew Barrymore, Noah Wyle, Jena Malone, Seth Rogen, Ashley Tisdale, Jolene Purdy from OITNB. The plot is a bit of a rabbit hole (pun intended), and you could spend days trying to piece together how the future connects to Donnie’s world, how he saved the universe, who’s trying to communicate with him; the director has a very detailed imagination. But it all comes down to how much you can enjoy this wacky story, and although I remember liking it when I was young and impressionable more than I do now, there’s still a cult quality to this film that demands our attention and remembrance.